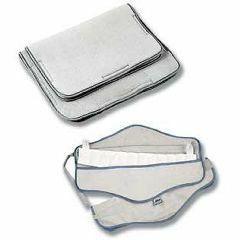 Hydrocollator Terry Cloth Covers create an effective porous buffer between the steam pack and skin. Eliminates messy towels. Hook and loop fasteners keep steam packs in place. Washable and can be used repeatedly. Available in a variety of sizes and styles. Foam-filled Terry Polyurethane foam between two layers of heavyweight terry knit weave. All Terry Constructed with four layers of all-terry material to withstand repeated machine washing and drying. Pocket Terry Covers Foam-filled terry covers with a convenient pocket to hold steam packs securely in position. How are these for relief >??? ?